The Upper Rockcastle is just the opposite of its famous downstream brother. 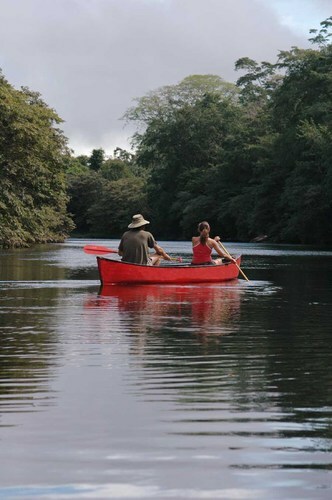 It is a calm, safe, relaxing, leafy paddle through dense forest. The only thing technical about it is a few tight turns leading into or out of Class I riffles. This is a great family run and youth group training experience. You can almost always reach down with your paddle and touch the sandy or rock bottom. There are a hundred great sand or rock pulloffs for lunch or snack breaks. It's a photographer's paradise. 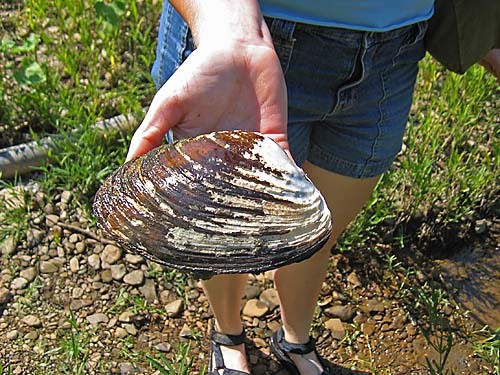 The fishing is good, particularly for Smallmouth and Rock Bass, but what it's really famous for is Freshwater Mussels. Some aquatic ecologists rank this as the top Freshwarer Mussel stream in the nation. The Upper easily makes a two day trip by putting in at Lamero (Route 490 bridge). There are many ideal riverside campsites. 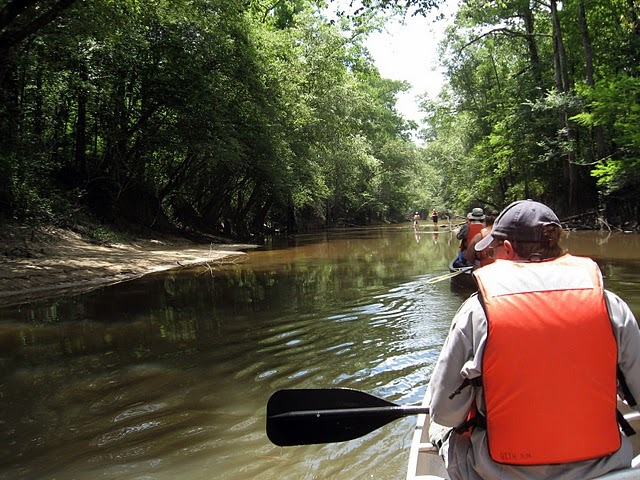 There are also many historical sites along the way : Civil War entrenchments, the original Wilderness Road, archaeological sites from old Shawnee villages along "The River of the Rock Castles," and natural arches. You could even expand this to a three day, 35 mile trip by asking Rockcastle Adventures to put you in 10 miles further upstream. 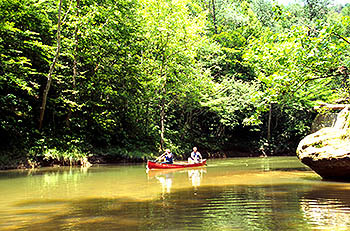 We believe the Upper Rockcastle is the prettiest canoeable stream in Kentucky. If you're into photography, this is your trip. The stream is very narrow and much of it is a tunnel through low hanging trees. It has enough weird shaped rocks to add variety. The long straights are in the first half of the day; during the last half the water winds continuously like a snake, the pools grow much shorter, the riffles much more frequent and longer. Everywhere you look the sun alternates with deep shade and the sandstone rocks are framed by emerald green leaves, setting up great contrast for photos. As a matter of fact, anywhere the Upper Rockcastle comes close to roads, you may see artists painting scenes or postcard photographers setting up tripods. During the Spring, the landscape is also brightened by wildflowers. The Sheltowee Trace, a 300 mile backpacking trail from Tennessee to Ohio, parallels the eastern bank of the river and crosses it once. The Upper Rockcastle is famous for its Freshwater Mussels. These are common in all clean running Kentucky streams, but the population is especially dense along this river. You can see extensive "beds" of these clam cousins. They're filter feeders, so can only survive in water that is very clean most of the time. During floods or occasional times of muddy or polluted discharges, they can dig down into the sand, close their shells and wait until the water clears up. But they can't wait too long. The fact that they are so thick here indicates the stream is pretty healthy through its entire watershed. 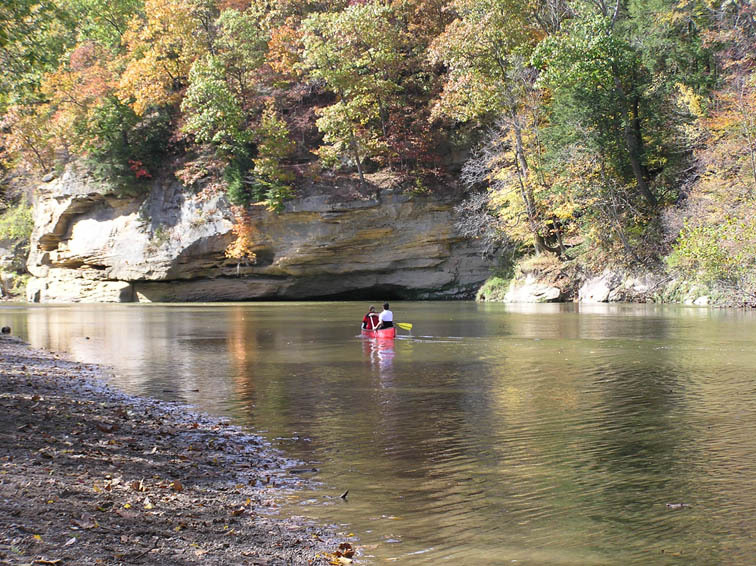 Access to the river is through Ruby & Doyle Huskey, Rockcastle Adventures, 606-309-2976. This is the oldest canoe outfitting service, although it has changed hands four times. To reach their Outpost, drive to London or Somerset, then follow 80 12 miles to the river, which is the Pulaski-Laurel County line. Just west of the high river bridge is the Route 1956 (Old London Road) turnout, to the north. About a mile north of 80, it crosses the river. The Rockcastle Adventure Outpost is to the right just past the bridge. It's a low steel building down over the hill from the road. A steep drive goes down a parking area, and a trail leads down to the water. 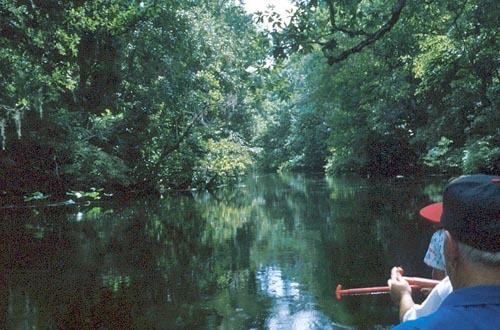 When you're canoeing down the river, as you pass under the highway bridge, pull river left and look for the take out. (Just as you begin the trip, you'll pass under the Route 25 bridge and I-75 bridge, but they're very high, and within 30 minutes of the put in. Then you come all day with no other bridges until the route 1956 bridge.) It's 10.7 miles of canoeing from the I-75 Bridge to the Route 1956 Bridge. If you use the Wilderness Road Put In, that gives you a 12.6 mile day. London has lots of motels and restaurants, halfway between put in and take out, about 30 minutes either way. You'll see plenty of fish on the Upper Rockcastle, but the most beautiful, delicate and interesting are the Darters. 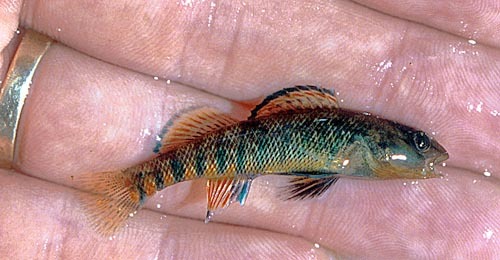 Shown at right is the tiny Rainbow Darter. These are perfectly formed fish that evolved downward in size so they could retreat to shallow water and evade their bigger predators. They exist in most small Kentucky streams, but icthyologists believe the Upper Rockcastle holds the largest total population and the most different kinds. Near roads, you may encounter university science classes from several states, knee deep in the river collecting these in nets and seines. Kids big into aquariums but without the money to invest in saltwater systems can stock their tanks with a dozen different kinds of darters and have a fine array of what look like brightly colored tropical fish but all come from local waters.